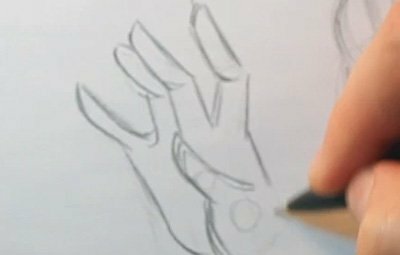 Do you want to learn how to draw realistic hands? This article has everything you need to get the symmetry right. When drawing the hands it’s best to think of the hand as being at rest. The tendons and muscles in our hand will naturally pull our fingers inward a little bit and this is what makes the fingers curl into a slightly rounded shape. Another thing that you can do to make the hand more interesting is to use asymmetry. You can see this in the drawing to the left where the pointer finger, which is sometimes referred to as the 2nd finger, is offset from the other fingers so they aren’t all falling in a perfect row. Here’s another example of changing up the symmetry of the hand to get a more interesting drawing. Notice how the fingers are grouped together in the example picture. The middle and 4th fingers are side by side, which gives a more interesting silhouette shape than if all of the fingers were spaced equally apart. Here’s the final example hand for this lesson and immediately you’ll notice that it has a much more dramatic pose as compared to the other hand drawings. While being dramatic the fingers all have slightly different curvatures and aren’t all clumped together naturally. To help realize what this asymmetry means when learning how to draw realistic hands- stop reading here and look at your own hands closely. Make a few different poses with your hands and see how the fingers move in comparison to each other. Then, try and position your fingers so that they all have exactly the same curvature to them and are all spaced from each other perfectly equally. 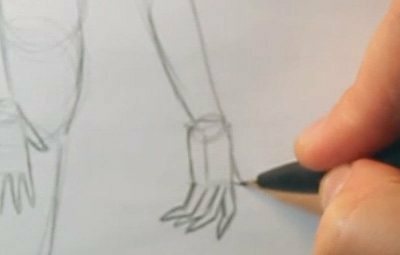 I think you’ll quickly notice just how hard it is to get a perfect hand position, so when you go into your drawings, always keep this in mind that perfect hands aren’t natural at all. You’ll always want to have some degree of variation in those hands to make them appear a lot more natural. Thanks for watching this LaurieB! 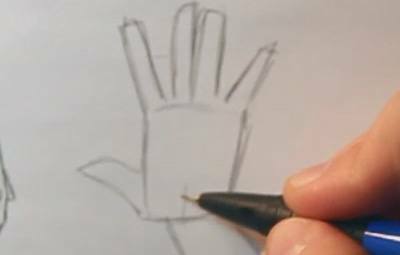 video on how to draw realistic hands!